"bread which is delicious because it provides relief and security" to people around the world. has not changed and as a result the Canned help bird has been helping out around the world since 1996. With bread made by Pan Akimoto, we want to spread spirit and smiles all over the world. Please help us with our dream. 1. It’s twice as big as our regular canned bread. It's safe because of the adoption of the “double safety pull-top” which doesn't cut your hands. 3. It’s a relief supply. Unused emergency rations are sent to help fight world Hunger. Bread that tastes like it just came out of the oven. It's special patented method gives us the ability to make the bread with no preservatives. ead that tastes like it just came out of the oven. over the world to help others. things such as a cup, or a bowl. Keep Kyu-Can-Cho for a certain period. can keep them for 2 years as emergency rations. to participate in the helping of others. You can donate and buy a new one at the same time. on your purchase of the Kyu-Can-Cho. And we will send you a certificate of thanks. Send Kyu-Can-Cho to starving nation. Yamato transport will take care of all the Shipping. 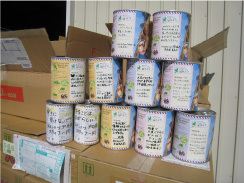 A Japanese NPO will then the bread in containers to those in need. You can help save the world. People who suffer from hunger receive Kyu-Can-Cho. You can send messages all over the world. for those who will receive the bread. Communication helps people in the world be better friends. You can be a part of the international community. Copyright © 2016 Pan Akimoto Co., Ltd. All right reserved.